Addressing the gathering Singh said the people of Mizoram have so many questions which the ruling Congress has no answer to it. 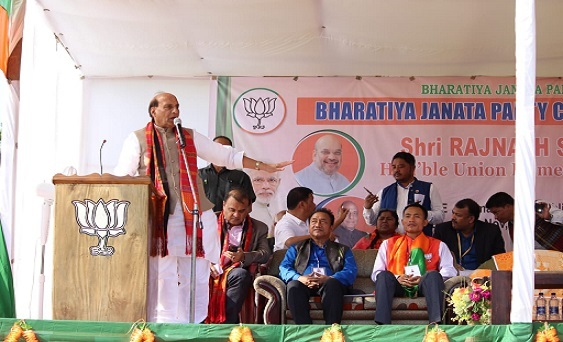 Union Home Minister Rajnath Singh on Saturday continued his campaign in southern Mizoram district of Siaha. A huge rally was held at Siaha district playground. “The answers are all with the BJP. Mizoram lacks even basic amenities. Vote for change by voting for the BJP. We will deliver the needs of Mizoram during the first six months of our rule,” Rajnath Singh said. The union home minister on Friday has campaigned in Mamit town of the western belt of Mizoram. “The BJP has fielded two good men for Palak and Siaha ACs. I appealed to the people of Siaha district to vote for change. It is not up to the BJP to make a change but the people themselves have to make change. Our candidates S Vadyu and Hiphei can deliver change,” Singh said. Palak constituency candidate Hiphei is the former speaker of Mizoram assembly who quit the Congress to join the saffron party. “During their tenure of ten years, the Congress government has failed to give you proper roads. If voted to power BJP will develop the road infrastructure of Mizoram within months,” Singh said. Rajnath Singh said that his party, if voted to power, would restructure the Mara Autonomous District Council under the guidelines laid down in the 6thschedule of the Constitution of India. “My team has already prepared a working plan to strengthen the CADC, it’s up to the people of Maraland, everything is already in place,” Rajnath Singh said. Rajnath Singh was accompanied by Assam finance minister Himanta Biswa Sarma and BJP national general secretary Ram Madhav.